When I was in NYC a couple weeks ago, I came across an amazing book store in Grand Central Station that had a huge collection of beautiful 2015 wall calendars. I spent more than two hours looking through all of the gorgeous calendars because I just could not believe the quality of the paper and vibrant colors. These were not your typical high gloss- cheaply made calendars, which brought us to today’s post for DIY framed calendar prints. 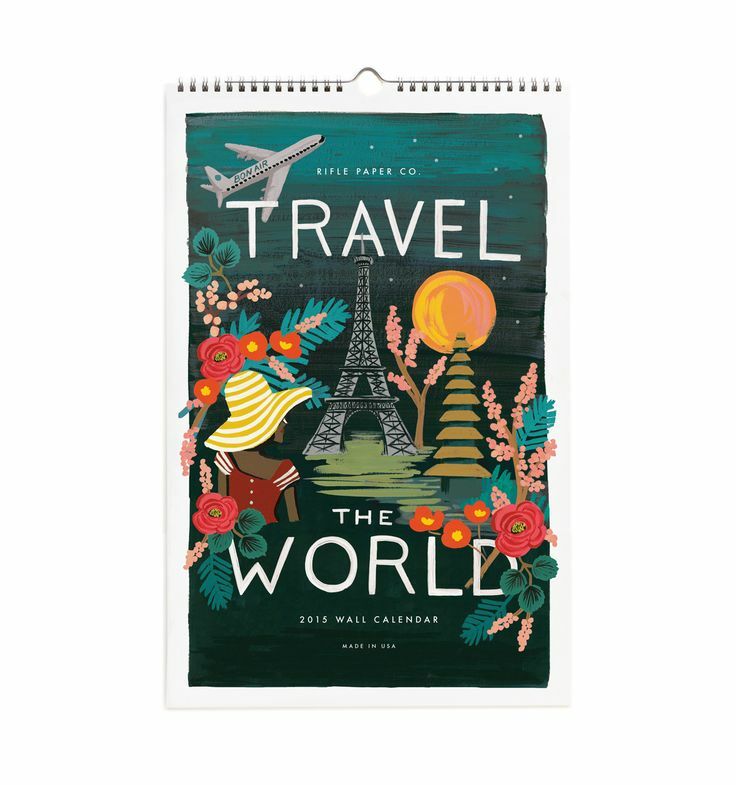 The minute I saw this calendar, I pretty much lunged for it because I knew I had to frame it for my daughter because we always talk about our travel bucket list. The best part is that several of these cities in the calendar on her list (Paris is number one on both of our lists). My girl and I are so excited with how fun this wall turned out! I hope that one day, she’ll get to check all of those places off of her bucket list. 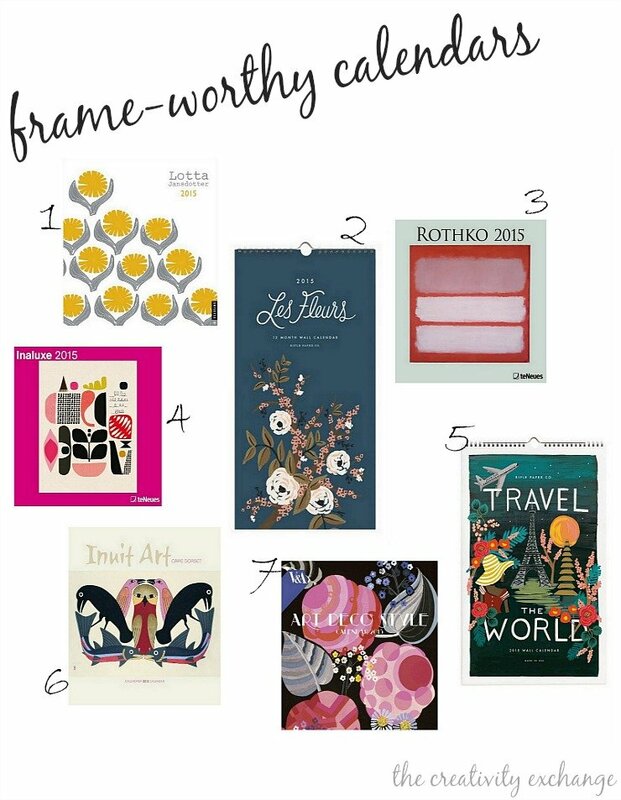 Framing the art work in a calendar as prints is super easy and inexpensive to do. I used (9) 11x 14 chrome frames (I spray painted them with Rustoleum gold) from Hobby Lobby that I picked up at 50% for $6.00 each. I also had mats cut the same size and brought the calendar with me so we could measure how much width I would have for the mats. This particular calendar really didn’t need the mats because there was a border and the art extended beyond the border. *****Update– I have received a lot of emails asking for more information about the mats that I had cut (10″ x 12″). Yes, having mats custom cut can be very expensive but I was able to use a 40% off coupon at Hobby Lobby for all of them, which helped keep the price down. I also know that Aaron’s Framing and Michaels run sales on framing/mats. Next, I used double-sided tape all the way around the backside of my mat, right at the inside edges. I then centered the mat over the art and pressed down to attach. This whole project cost me about $100.00, which is such a great deal for such a beautiful (and fun) print collection. If you haven’t had the chance to see all of the fun DIY projects that we did for my daughter’s room a few months ago, you can check out that post here. By the way, I took notes of all the calendars in the store that were fabulous and perfect for framing and after I did this post, I shared a round-up of my other favorites (pictured below) and you can find that post here. I’m hoping that you guys will see something in the group that inspires you to frame! at such a reasonable cost. I can’t wait to see the round-up of all your favorites. I’ve been looking for something to fill a large expanse of blank wall in my family room. One of the calendars may just be the ticket! I also love the design on your daughter’s dresser. What brand of paint and color is the pink? Thank you so much Susan! Yes, I had no idea calendars had evolved to print quality level! I can’t wait for you to see all the great calendars on Thursday! We painted the dresser with my favorite paint from Velvet Finishes in the color “Glamorous”. 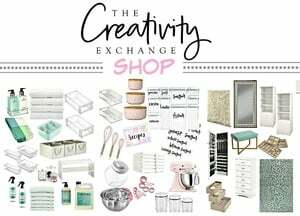 I shared the project details in this post here: https://www.thecreativityexchange.com/2014/03/creative-ways-to-paint-childrens-furniture-paint-it-monday.html Thanks so much for stopping by! Looks incredibly beautiful in her room. I will have to check out some calendars more carefully now. What a great idea. Wow, it looks amazing! You just inspired me to do something similar with old vintage railway postcards. I remember over 30 years ago we used to go yard sales and one of the things we were on the lookout for were calendars. Lots of people would pick them up as gifts for their family & friends. They were so pretty on heavier paper with a nice finish. 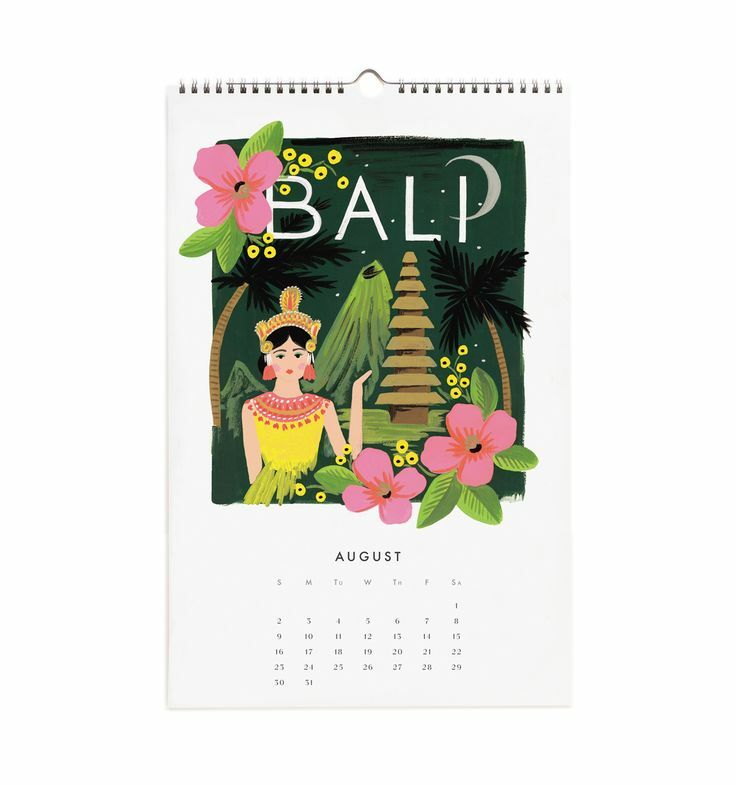 Because the calendars were so NICE, most people would not use them, so good for us thrifters, and due to the calendar being out of date, people sold them in almost new condition for under a dollar! My mother in law and I used to collect floral and Audubon water colors. We collected frames, mostly wood to refinish. Then it was fun to assemble a full wall collection! Loved those times! LOVE your calendar and the meaningful wall art you made for your daughter’s beautiful room! Looking forward to seeing other calendars and link to source! Thank you for your generosity with your readers! I remember those calendars many many years ago. My grandmother collected them. Not sure what ever happened to them but she just loved them and coveted them! On Thursday, I’ll be posting two other vintage travel calendars that I saw. It’s not Florida but it may be something that you would love. Thanks so much Mary Ruth! Thank you Cyndy, how cool are these. I will definitely buy some. I love calendars that are beautiful enough to frame. I especially love travel ones. They are so colorful, unique and remind you of your future travel plans. I have told you before, but your daughter’s room is the cutest I have ever seen. I can spend hours in book stores. I miss “Half Priced Books” so much since we moved from TX to GA. Do you have one in your area of TX? If you get the chance, definitely go to one. The ones in the Dallas/Ft. Worth area are fantastic. I would spend hours in them. Many of my fav design/décor books are from there. I have told them how much I hope they will open one in GA. They have amazing prices and will buy your old books and magazines. You know Debbie, I was just thinking about Half Priced books the other day and we used to have one in North Houston but it closed and I LOVED it and did all my Christmas shopping there! I remember it was such great deals on the really high end coffee table books. 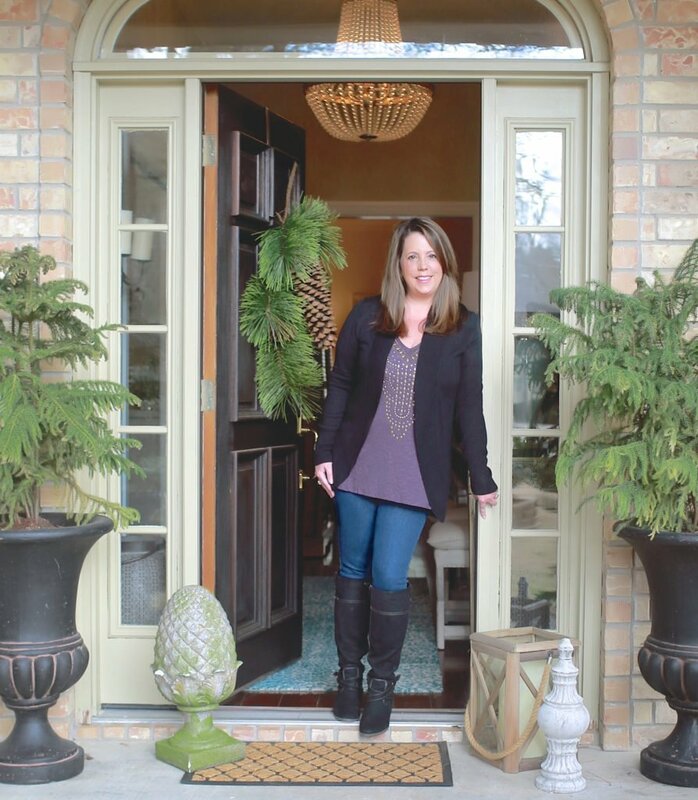 I would love to track one down because I would love to start collecting some of the interior designer books. Those books full price can be $75-$100! Yikes! I just bought the big Chanel book for $60.00. I wonder if there is a place online? I’ll have to research. Love all the colors in those calendar pages. I have framed pages from a Cavallini calendar that has birds and plants. 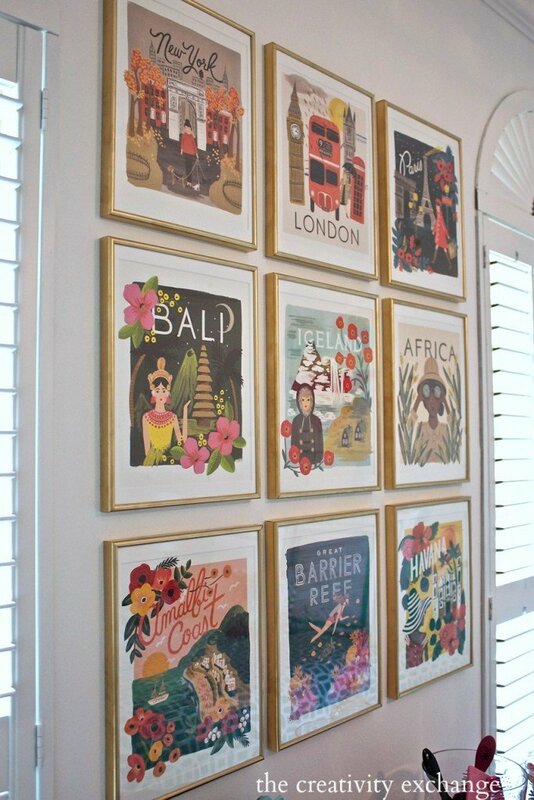 Such an inexpensive way to come up with beautiful art. What an delightful wall! I have passed on your idea to someone who is decorating a new house. This looks awesome! It seems to blend in perfectly in her bedroom. Can’t wait to see Thursday’s prints! Thanks for the inspiration. We’re doing my teen daughter’s room and she loves the travel posters. Where did you find the brass round tray on the dresser? I picked it up at Homegoods last year Jennifer. I saw some very similar last week. Hope that helps! Thanks so much for stopping by! Where did you get the Frames? 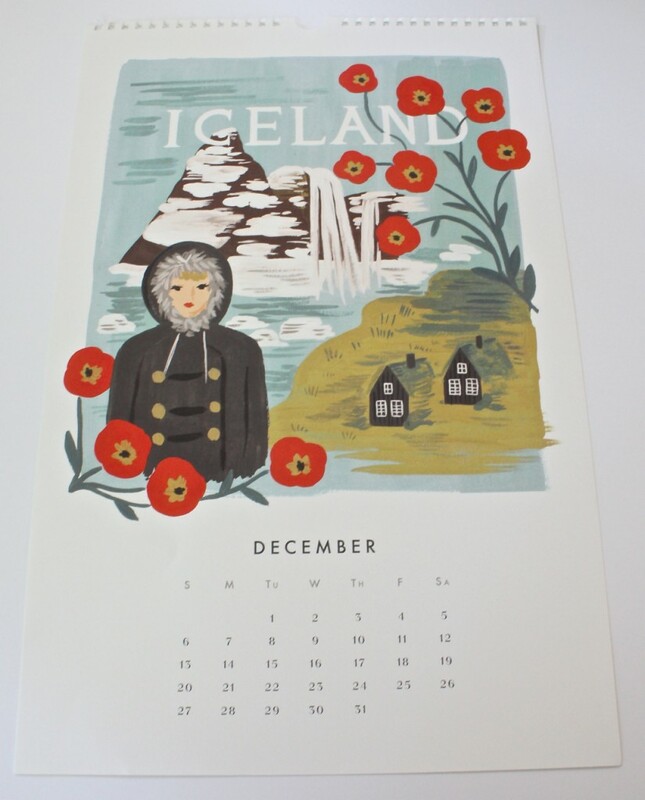 I have the her calendar from last year that I want to re-use but I can’t find frames that I like…. this is such a great idea though! thanks for posting! This is so beautiful! Just bought the calendar and plan on recreating the next rainy weekend at home. Great project! I also am wondering if the mats were from Hobby Lobby, what size, and did they cut them or did you? Thanks! I have been saving several calendars for just this very idea. Thanks for the reminder to get the project started. Your project is beautiful. who/how/how much did it cost to get the mats cut for them? I got them done at Hobby Lobby and used a 50% off coupon. I had 9 custom cut and and it ended up being around $35.00. I took the calendar in and we measured the two largest images as our guide and had the mats cut the same. Hope that helps Sarah! So I bought this calendar, picture frames, and spray paint! But I am having the hardest time trying to figure out what to do about the matting! I know you said that I didn’t really need it, but after seeing it with I couldn’t go without it! What size mats did you get, how did you cut them, and how did you do it so well! I tried to cut a couple and it was just a disaster! I am a little artistically challenged- but my roommate is great! Thank you for your help! I am working on cutting mats right now at my house to fit these prints. If you buy 11×14 frames with mats included to fit 8×10 prints, you need to use a straight edge and cut leaving 1/2 inch on three sides, for the bottom to cover up the two rows of writing, take off 1/2 an inch. I got black metal frames that included mats at Target for $6.99 a piece (they were an additional15% off using the red card 5% and a 10% off code). I am using a rotary cutter and a cutting board, and also some sharp scissors to finish off the mat cutting. So far, so good! I absolutely love these prints! 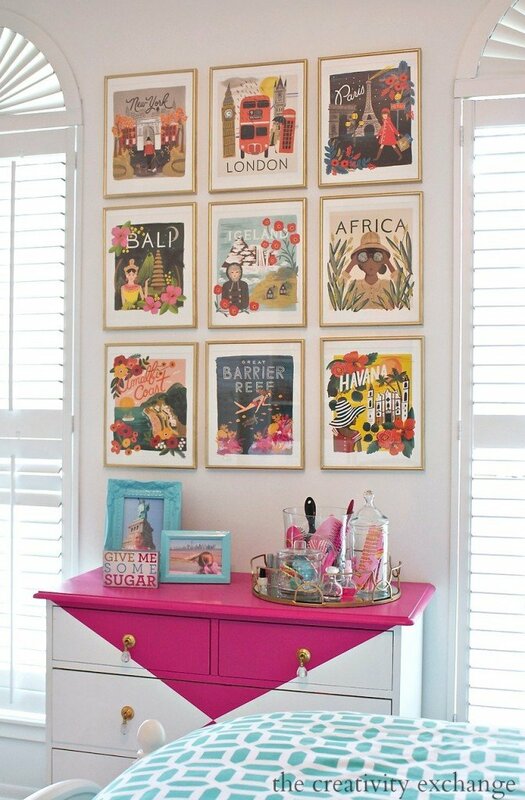 Such great inspiration for my teenage daughter’s room! I would love to know the sources of your bedding, heart print, and chandelier. Would you mind sharing? Hi Steffanie! Thank you for your note! 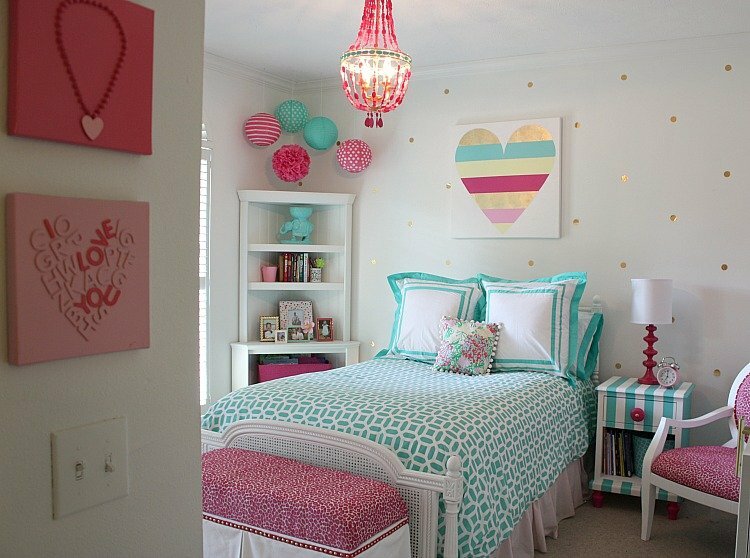 The bedding is from Pottery Barn Teen (the color is Pool), the heart print is a custom painting that I did (you can contact me via email if you want to order one) and the chandelier I painted and you can find the tutorial here: https://www.thecreativityexchange.com/2014/03/diy-painted-empire-chandelier.html Thank you so much Steffanie for your note and stopping by!! This is really awesome. Thanks for posting! Love this! I ran out to get all the stuff to do this myself. Question how and where sis you get the mats cut that size? Thx for the great ideas!!!! What a magical calendar find. Thank you so much for explaining the process to create the wall art. On a miniature scale, one could do this same project using Post Card books found at Pomegranate Publishing and Dover Publishing web sites. The post card quality is wonderful, you get a book of 30 for about 11.00. The themes are endless. I like the post card books of art, folk art, Arts and Craft artists, and textiles, etc. 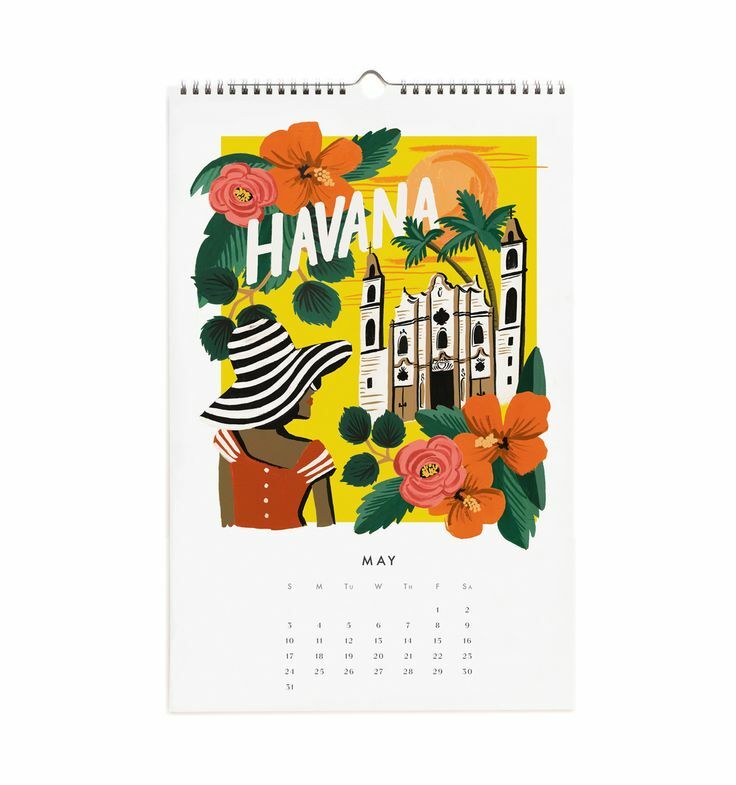 I love the travel calendar you found and the vintage feel of it. It beckons one to travel. 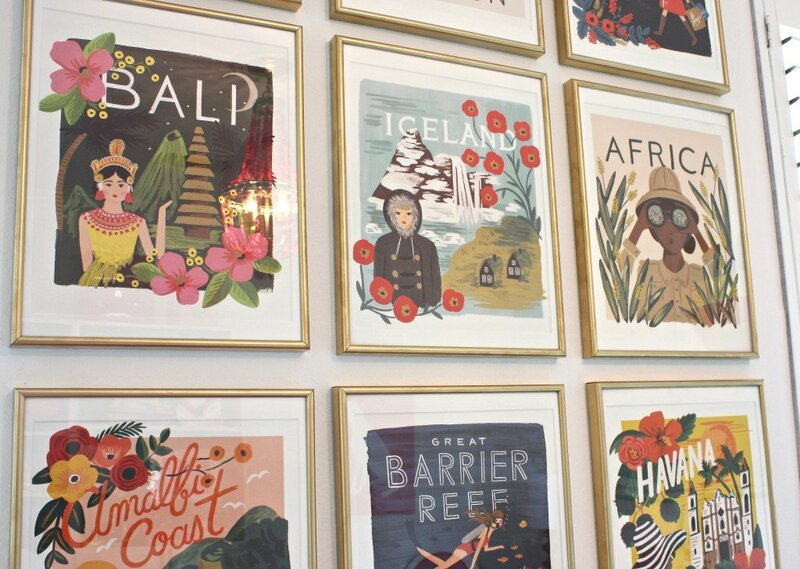 Am also liking Rifle Paper Co.! So glad I found your site. Thank you so much for sharing. I love this! I bought the calendar. Any chance you would want to make the frames with the mats cut and sell them to me? I’m not as crafty as you! 🙂 Thanks for the inspo. Just bought my calendar. Can’t wait to do the same in my daughter’s room. Thanks for such a inspiring idea! Love this whole idea! Do yo have the link the the frames you used? Just lovely! Thanks for sharing. These make the room! I just finished this project! Although I tried cutting the mats myself, they just don’t look good! I highly suggest just going to a craft store and having them cut mats for you. You need to measure and cut each one individually, if you want the mats to look even at top and bottom. All the mats will be different sizes. Without a discount, the mats run $10 each at Hobby Lobby. Expensive, but wow, does it look much better than trying to cut them yourself! I took the largest of the print design out of all of the months and had the mats cut the same size based off of the largest one. That way, all the mats were the same size. I had them cut at Hobby Lobby and the were $7.00 each without the 40% coupon. With the coupon, they were $4.40 each. I have mats cut all of the time in various sizes and it’s always $7.00. I like to use the “Bright White” mats, not sure if that is cheaper. I’m not sure what Michaels charges and I think there are some discount online sources for custom cut mats as well. Thanks for your note Robin! I did this in my guest bedroom. Thanks for all the detailed information. I loved your wall the minute I saw it. So glad I came across it on Pinterest. Excellent post. I purchased the inaluxe and Inuit art calendar on sale at calendars.com (both 50% off!) and have already framed 4 inaluxe prints using ikea frames and custom matting. You are right about the matting….so expensive. For the next 8 inaluxe prints, I am going to have to do without the matting and just purchase smaller frames. Thanks for the info. I am loving this project. I absolutely love this and I was so happy to snag the calendar through a Black Friday sale. I’m just now getting around to framing the prints…I know, almost a year later! The calendar looked so white until I went to buy matting (I’m cutting my own) and most of the matting is either way too bright white or too dark of a creamy color. I was just curious if your mats are a perfect color match as they appear to be in your photos or if they’re slightly whiter than the calendar prints? Thanks so much for sharing this lovely idea! I love how this turned out! I framed the 2014 Rifle cities desk calendar in 9×9 ikea frames above my bed, but would love to do the same with my 2015 calendar after this post! 🙂 Thanks for sharing!!! 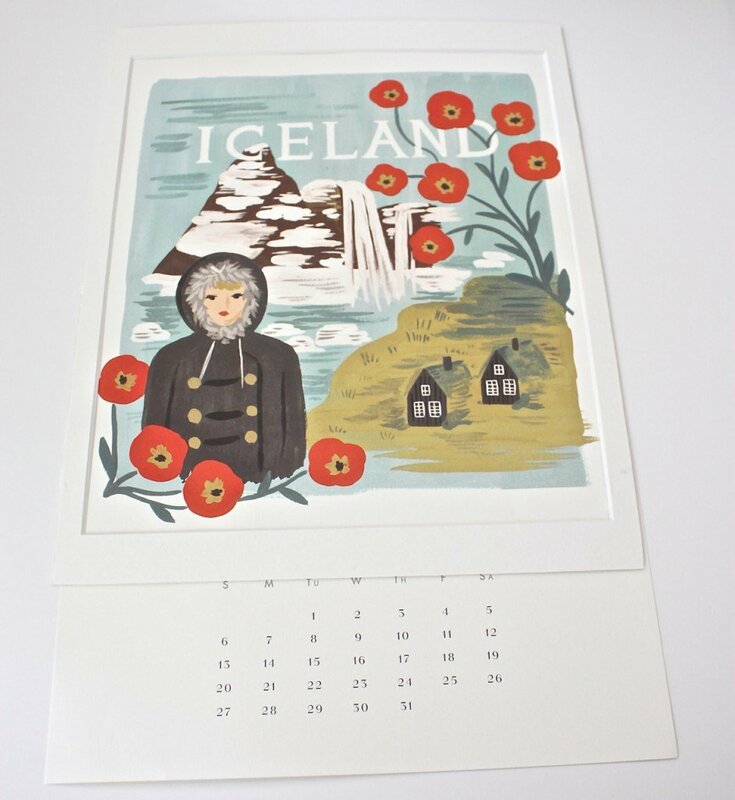 Do you know anyone that has tried this project with the small desktop calendar with these prints? I measured out the dimensions and it looks like the calendar would be quite small which means the photos would be even smaller. Do you think it would be worth a try!? Any advice?! 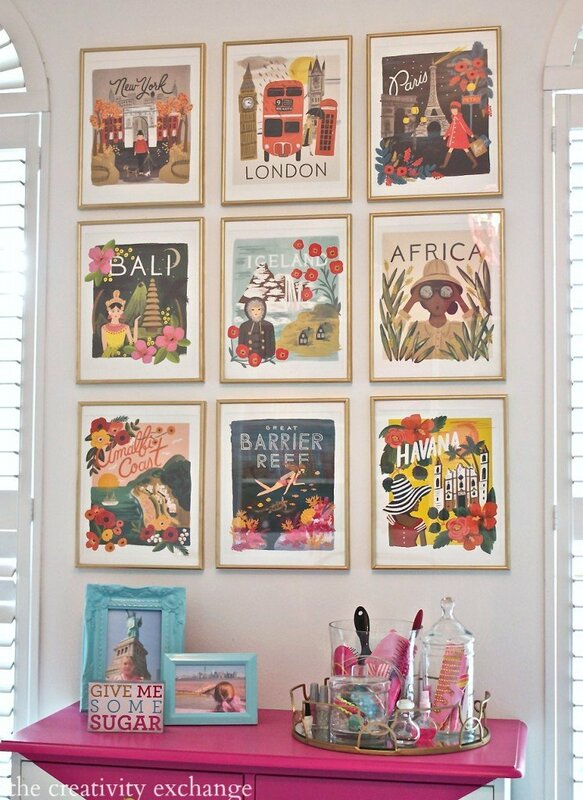 I love these prints and the new travel wall prints just aren’t the same. As a “real” adult in my own home now, I still have my box of Looney Tunes decorations. My parents are in heaven so no more offers for framing. LOL I came across your post looking for DIY calendar matting. I’ve decided that my gourmet kitchen will be filled with laughter for my soul again! In addition, I have calendar prints of encouragement that I would like to mat and possible frame. All this to say, your work is beautiful and thanks so much for the tips! I have my frames picked out and the calendar came in yesterday so I’m heading to Michael’s today to have my mats ordered. So excited. Thank you so much for this idea. I have been looking for something to do with the wall over my desk for a long time. Beautiful room. Where did you get the corner shelves? ?